Best read in the Cookbook ! also Travis CI, code coverage, testing with Prove. Gitlab CI is based on Docker. With image we tell it to use the daewok/lisp-devel one. It includes SBCL, ECL, CCL and ABCL, and Quicklisp is installed in the home (/home/lisp/), so we can quickload packages right away. If you’re interested it also has a more bare bones option. Gitlab will load the image, clone our project and put us at the project root with administrative rights to run the rest of the commands. test is a “job” we define, script is a recognized keywords that takes a list of commands to run. Suppose we must install dependencies before running our tests: before_script will run before each job. Here we clone a library where Quicklisp can find it, and for doing so we must install git (Docker images are usually pretty bare bones). This will download the lisp image (±400Mo), mount some local code in the image where indicated, and drop us in bash. Now we can try a make test. Here we defined two stages (see environments), “test” and “build”, defined to run one after another. A “build” stage will start only if the “test” one succeesds. 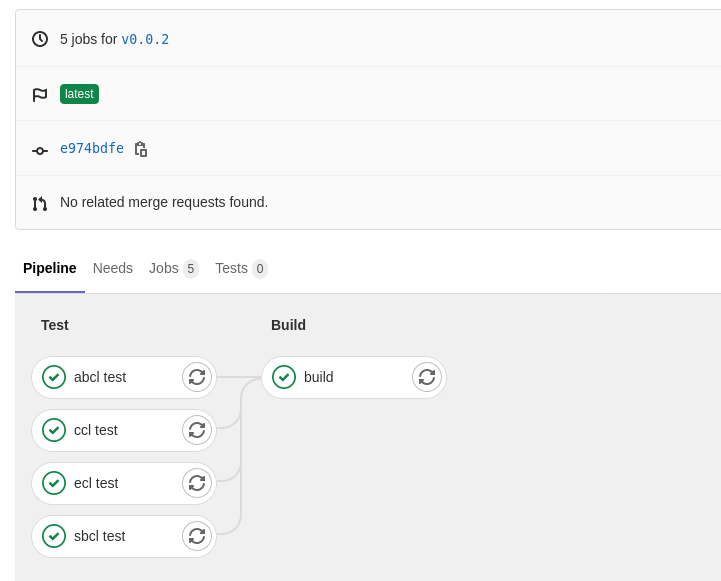 You now have a ready to use Gitlab CI.